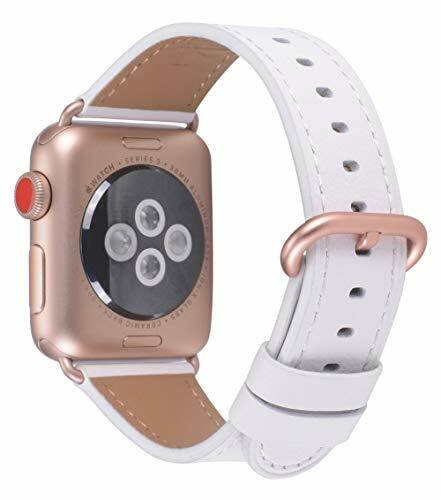 The Adapter and Buckle: The Adapter and Buckle Matches Perfectly with the iWatch Gold Aluminum Series 4 and iWatch Gold Aluminum Series 3.Do Not Match iWatch Series 2 & Series 1 Gold. FIT SIZE: 38mm Size fits 5.5"-7.5" (140mm-190mm) wrist. (for iWatch 38mm and iWatch 40mm). Superior Quality Leather:100% Genuine Full Grain Calf Leather Band. No plastics or cheap fillers. Anti-slip & sweat-absorbent,durable,comfortable,breathable & no peculiar smell. Adapters: The adapter is sturdy enough for daily abrasion, easy to install, no screws or screwdriver needed, and you don,t need to worry about the adapters fall apart easily. 1 Year Warranty: Provide free replacement or full refund immediately.If you have any question or problem, please contact us, we will resolve it for you effectively.